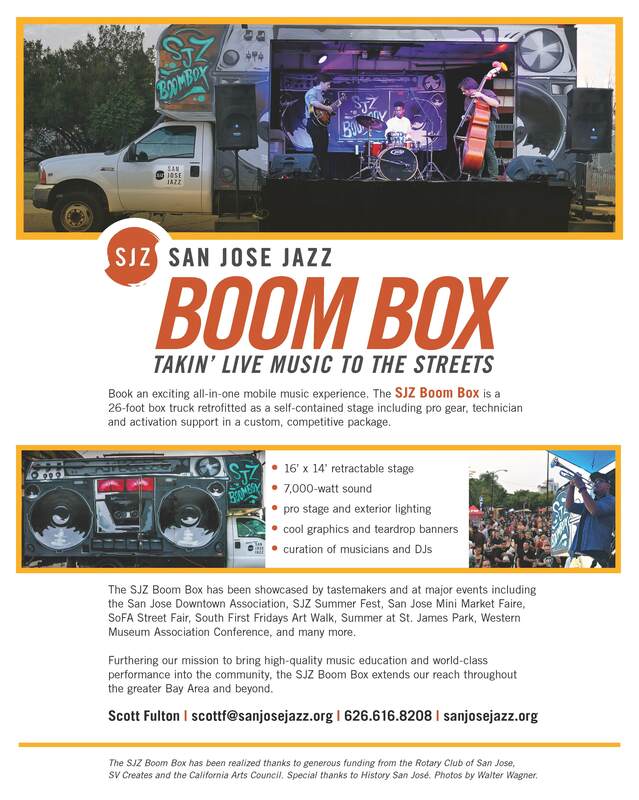 With our newest initiative, San Jose Jazz takes its high-quality music programming to the streets! Modeled after Harlem’s Jazzmobile initiative, the SJZ Boom Box delivers an all-in-one live music experience. The project furthers our mission to bring music education and world-class performance to the community, extending SJZ’s reach not just around San Jose but throughout the greater Bay Area. As we’ve seen with our Progressions program, exposure to music and the arts can educate and inspire those who may not have had the chance to experience it otherwise. With the power to present great live music virtually anywhere, the SJZ Boom Box offers a flexible new venue where we can share the rich cultural legacy of jazz. The SJZ Boom Box can provide you an all-inclusive solution to ensure your event is a hit! All we need is access to power, and we’ll take it from there. 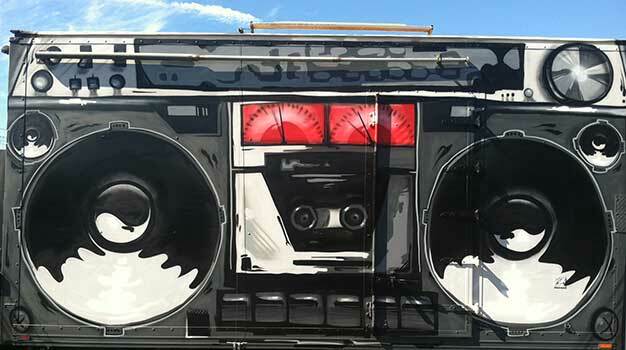 The SJZ Boom Box contains a 16’ x 14’ retractable stage with 7000-watt sound, pro lighting, with cool exterior graphics hand-painted by an artist working out of Empire Seven Studios. Not sure who to present? Our curating skills and extensive network of musicians will pair the right act with your event, and our list of vendors and partners can provide additional activation as needed. We’re also able to help spread the word through SJZ’s social marketing channels. The SJZ Boom Box has been realized thanks to generous funding from Rotary Club of San Jose, SV Creates and the California Arts Council. Special thanks to History San Jose.